Thailand is one of the world's most popular tourist destinations. The beautiful Southeast Asian country has pristine beaches studded with palm trees, ancient ruins, vibrant cities, and elaborate Buddhist temples. The tropical country has so much to offer, but three of the places in Thailand that are a "must see" are Bangkok, Chiang Mai, and Phuket. There are many attractions in Thailand; you'll have to do some careful planning to see everything. Bangkok, the capital, is the epitome of the urban city. It's bustling, fast-paced, and diverse. Experience Bangkok at the many markets or tour the historic temples. Bangkok has luxury accommodations, upscale restaurants, and is a shopper's paradise for bargain hunters. For first-time visitors, you can get a real sense of the city when you spend a day or two in the same area. By contrast, Chiang Mai has a different atmosphere. The city is north of Bangkok, on the Ping River, with exotic hill tribes, mountain landscapes, and local craftsmen. The infrastructure is basic, and the city has a rural charm with small neighborhoods. The mix of old and new features historic temples near contemporary buildings and shopping malls. The lush countryside and mountains are only a half hour from the city. Phuket is where most visitors go for relaxing beach vacations. More than 30 beaches are scattered around Thailand's largest island and are among the loveliest in the world. Spend a leisurely day relaxing at your luxury Thonglor hotel in the heart of Bangkok. The hotel has some of the best restaurants in the city, trendy bars, and contemporary studios and suites with every amenity for a relaxing stay. The hotel features a breakfast restaurant and in-room dining. For your convenience, a supermarket that's open 24 hours and a mall are adjacent to the hotel. Go on an evening dinner cruise on the Chao Phraya River. An authentic Thai feast that includes seafood and curry dishes and sweet desserts is prepared for guests who sample local delicacies. On the cruise, you'll see Bangkok's historic temples and elegant palaces. The Grand Palace and Wat Arun are just two of the sights you'll see on the cruise. On your first morning in Bangkok, depart for a day of sightseeing to visit some of Bangkok's iconic attractions. Arrive in Wat Traimit to the Temple of the Golden Buddha. The statue is a 900-year-old, solid gold image of Buddha. Travel to the Temple of the Golden Dawn, known as Wat Arun. The temple is one of the most photographed in the country. Continue to Wat Po, Thailand's oldest temple. After stopping for lunch, visit the Emerald Buddha and the Royal Grand Palace. Wat Pra Kaew and the palace share a compound, but the architectural styles are quite different. All these attractions are close together so they can all be visited in a morning or afternoon. In the evening, head out to Asiatique, the night bazaar on the river. The bazaar opens each day at 5 p.m., so you have a lot of time to browse the 1,500 boutiques. The bazaar features more than 40 restaurants, so have dinner before you shop. Chareonkrung District is another great place to shop. The floating market gives you a glimpse into the lives of the people who live on the many, small canals. Sample some of the local, seasonal fruits including papaya, mangoes, and rumbatan, and try fresh coconut juice from a local farm. After visiting the market, return to your hotel in Bangkok for a leisurely swim in the infinity pool. Enjoy a delightful dinner in your room, then head down to the hotel bar for your favorite cocktail. You'll want to spend a day at one of Bangkok's malls shopping for many upscale brands that aren't familiar to Western tourists. The shopping malls are one way to experience the culture of Bangkok since many locals go there to socialize. MBK, Siam is similar to an indoor market with more than 2,000 shops that are popular with locals. CentralWorld, Siam is the largest mall in Thailand with designer boutiques, gourmet food, and entertainment including an ice rink and theater complex. Siam Paragon in Bangkok is a huge, luxury mall that features trendy shops, restaurants and cafes, Siam Ocean World Aquarium, the largest in Siam, and the Cineplex with 16 screens. Nong Nooch Botanical Garden and Bang Saray Beach is a one-day tour from Bangkok that allows you to spend some quiet time enjoying the beauty of Thailand. The botanical garden is the ideal spot to spend a morning roaming through the stunning themed gardens that include cactus, Roman, Caribbean, and French. After visiting the garden, have lunch at Bang Saray, then spend the afternoon at the beach. If you want to spend some downtime, head to the Scala Cinema in Siam Square, a refreshing change from the theater complexes in the malls. The theater built in 1967 features a beautifully maintained building in an old world-style. The Scale only has one screen, the prices are very reasonable, and the popcorn is great. One of the best things about the theater is that it shows a lot of Asian and European indie films. Explore the local culture at the Bangkok Art and Cultural Centre is a gallery with changing exhibits, sculpture, photography, and paintings. The museum is a favorite spot for students since admission isn't charged. The center features shops and cafes. After visiting the center, stop at one of Bangkok's many cafes for a delectable dessert and tea. The Secret Garden, Coffee Beans, and Agalico Tea Room in a charming English garden are favorites. On day 7, travel to Chiang Mai and check-in to your hotel. Chiang Mai in northern Thailand is famous for its diverse environment, beautiful beaches, and mountain scenery. Stay at the Five Star akyra Manor Chiang Mai, a charming, boutique hotel built around a private courtyard. The luxury hotel is near restaurants and bars, coffee shops, galleries, and trendy shops. After settling in, travel to Doi Suthep Temple, situated on a Chiang Mai mountain with spectacular views of the city. Wat Phra That Doi Suthep is a historic and sacred temple in Chiang Mai and is more than 700 years old. The International Buddhism Center is on the temple grounds. Bhubing Palace, the holiday residence of Thailand's Royal Family, is at Doi Suthep. Spend the afternoon enjoying the sights of the old city. The evening entertainment includes a traditional Khantoke Dinner with traditional Thai dancers. The Elephant Safari departs from the Elephant Camp in the jungle. You'll ride along the trails and see how the elephants are trained to work with people. On your return. Lunch is served at the Elephant Camp. In the afternoon, take a bamboo raft trip down the Mae Taeng River. On the way back to the hotel, you'll stop at the Orchid Nursery to see the exotic blooms. Another tour is the Chiang Mai Night Safari that features three zones, Jaguar Trail, Savannah Safari, and Predator Prowl to visit on a tram. In the morning, travel to the Mae Sai border, the area that connects Myanmar and Thailand, for a tour of the market. You can shop for gemstones, jewelry, clothes, and silver products. Lunch is at a local restaurant. In the afternoon, visit the Golden Triangle, the border that connects Thailand with Myanmar and Laos. Stop at the Opium House to learn about the history of the opium trade. Return to the hotel. Doi Inthanon National Park is to the south of Chiang Mai. The sacred Wat Phra That Si Chom Thong, the trail through the jungle called Michael's Trail, and Wachirathan Falls are attractions in the park. Visit the pagodas and go to the summit of Inthanon for spectacular views and photo opportunities. Several restaurants are in proximity to the park. Stop for a relaxing lunch before heading back to Chiang Mai. Depart from Chiang Mai to the natural beauty of Phuket and its beautiful, sandy beaches and enjoy a leisurely day exploring the region or relaxing at your hotel. 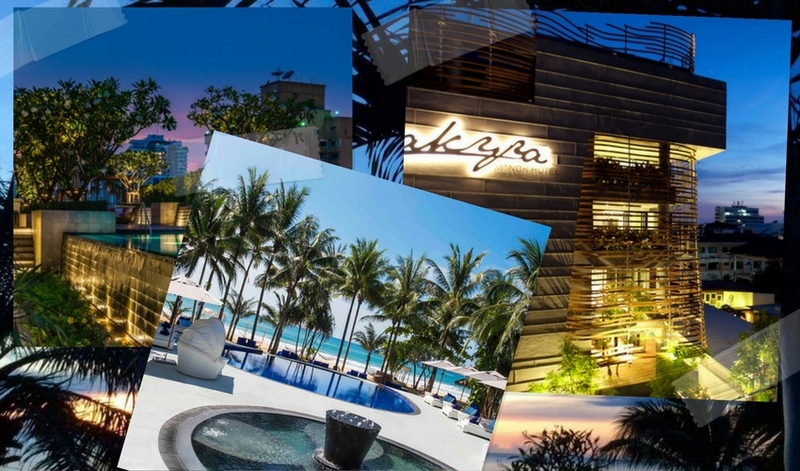 The akyra Beach Club Phuket is a luxury beach resort in one of Thailand's loveliest destinations, on the Andaman Sea. Relax with a massage in a beachfront cabana. The Ayurah Spa offers an array of spa treatments. Relax in a lounger and sip your favorite cocktail. The resort serves a breakfast buffet at the Upper Deck Restaurant. Meet friends at the Offside Sports Bar for Happy Hour. Phuket's most popular beaches are Nai Harn, Kamala, Kata, Patong, and Karan. North of the island you'll find beaches that are more secluded if you're looking for solitude. Spend the day island hopping and exploring Phi Phi Island, the location of the movie "The Beach." Spend the morning snorkeling or swimming at Loh Samah Bay. Explore Viking Cave and go sightseeing at Peleh Cove and Maya Bay. Have lunch at Phi Phi Don Island. Explore the coral reefs and swim at Monkey Beach. Have a brief stop at Khai Nok Island before returning to your hotel. Take a trip by boat to Phang Nga Bay for a leisurely cruise to the limestone islands of Koh Panyee or James Bond Island. The scenery is spectacular, and it's relaxing being away from the crowds. The families on Koh Panyee are direct descendants of the original settlers of 200 years ago. The island is small and features several shops and restaurants. Feeling adventurous? Take an ATV tour of Phang Nga. Take a tour of the jungle, plantations, and farms. When you go off-road, stop at a shallow river. Enjoy the waterfalls and swim in the cool river. In the afternoon, ride to a mountain top for panoramic views. Stop for a snack before returning to your hotel. Phuket is an exciting place to explore. Explore the city and go to Phang Nga Road where the elaborate Shrine of the Serene Light, constructed in 1889 is located. The lovely Chinese shrine is one of the most popular in Phuket Town. The shrine underwent a complete renovation and was publicly opened in 2013. Upon leaving the shrine, Siam Indigo, one of the city's newer restaurants, features Thai-style fusion food as well as housing an outlet for the newest fashions and an art gallery. At the end of your two-week tour of Thailand's exciting cities, beaches, and lush countryside, you'll depart from Phuket International Airport for your journey home.